The text opens with an image of Julián in a pool with five women; one of the women is his abuela. Julián and his abuela are then shown walking towards a subway, while three women with dramatically made up hair trail behind in mermaid attire. 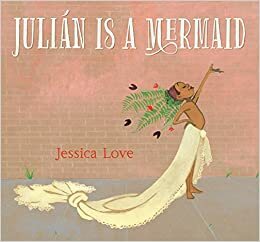 Julián, his abuela, and the mermaids are introduced to the reader through text that simply states: “This is a boy named Julián. And this is his abuela. And those are some mermaids”. Once on the subway, Julián and his abuela sit close and lock eyes. In fact, they hold one another’s gaze throughout the text, communicating through eye contact and physical proximity. A book about mermaids sits open in Julián’s lap. On the facing page Julián stares at the mermaids who entered the subway after him while his abuela continues to watch him. One of the three brown-skinned mermaids, finding pleasure in performing femininity, tosses long black hair over her shoulder, another twirls her tail, and the third, a pink haired mermaid, waves at Julián. The next scene brings the reader on a journey into Julian’s dreamscape. A wave laps at Julián who soon drops his mermaid book as fish begin to swirl around him, his hair miraculously grows longer, and he slips out of his clothes to be more comfortable in the changing, now quite watery, environment that has replaced the subway car. The next image stretches over two pages. Julián is depicted with long flowing dark curls. His body is blocked below the torso by a cluster of sea creatures. On the following two-page spread, Julián has transformed into a mermaid with a soft pink and glowing orange tail. He enjoys his body, admires his tail, and does back flips in the water. He also confronts a large blue fish. He locks eyes with the fish, much as he and his abuela stare into one another’s eyes; seeing each other. His arms stretch in front of him towards the fish, imploring or receiving, perhaps both, as a necklace dangles from the fish’s mouth. Julián is pulled back into reality by his abuela who stands above him, glancing over her shoulder while saying: “Vamonos, mijo. This is our stop.” On the next page they are seen walking away from the subway car. He glances back at the mermaids who smile and wave at their young admirer. Water is present throughout the text, infiltrating the city’s summer heat, and carrying the watery fantasy of mermaids into the urban reality of children trying to beat the heat, illustrated in the next image as three girls play in water streaming from an open fire hydrant. On the facing page, Julián asks his abuela if she saw the mermaids too, which she affirms in an exchange that evinces an unclear boundary between fantasy and reality and complicated relationship between the two. The next image alludes to Julián’s fantasy of becoming a mermaid while acknowledging the constraints of reality. Echoing his fantasy on the subway car, Julián tosses off his clothes before making himself a crown of plants that creatively imitate the long girlish locks of his mermaid fantasy. He finds inspiration for a mermaid’s tail in a flowing curtain that he wraps around his waist. Yet again the text folds fantasy and reality into one another; importantly fantasy predate the reality, which suggests the importance of imagination in world making. When abuela appears after her bath enveloped in white towels, Julián presents himself to her as he did to the fish in his previous fantasy. Abuela doesn’t look pleased and quickly departs from the room. On their walk they turn a corner and stumble upon mermaids. An awestruck Julián whispers, “mermaids.” Abuela’s response is neutral: “Like you, mijo. Let’s join them.” Although her verbal response is quite matter-of-fact, her actions are unabashedly collaborative as they join the parade together. This is where the text ends. In this short image driven book femininity is represented as artfully achieved and desirable, a little boy’s dream of becoming a mermaid is represented as acceptable and possible, and the line between fantasy and reality is depicted as fluid, like the waves that carry us through the text’s action. The complicated relationship between fantasy and reality suggests the importance of imagination in shaping action. Even more, the reader’s only clue into Julián’s gender identity is unresolved; although he does carry a mermaid book on the subway car it is too stingy a clue to warrant an argument about Julián’s essence, the truth of his desire is something we must take as tethered to time: Julián is a mermaid… today. The community of mermaids abuela introduces Julián to is itself a temporary one. The parade alluded to is an annual event that begins and ends in mere hours. We must read the desire presented in the text in its radical here-and-nowness, without recourse to a legitimating past or future that acts as explanation.